I’m putting the finishing touches on a slip of a book (21,000 words) and will be uploading it to Amazon’s Kindle digital publishing, KDP, in the next week. The book, The Setting of the Sun, tells a story about love – and love’s power over death. Because the love I saw between my maternal grandparents inspired the story, I chose their home town, the city of Lawrence, Massachusetts, as the location of the story. My grandmother, like the main character in The Setting of the Sun, was born in 1898. Lawrence was a thriving mill city at that time – a planned city (designed by the Essex Company), which sits on the shores of the Merrimack River, from which the mills drew their power. I did a small amount of historical research for this work of fiction. But I also grew up in a small town a few miles from Lawrence, so some history of the city was sort of innate to me. My mother was my first editor for The Setting of the Sun. Educated in the solidly good Lawrence school system of the ’20s and ’30s, she had a strong grasp of English grammar. We had no idea at the time she was editing The Setting of the Sun that she’d be gone from this life within a year. I’m so glad now that as she edited it, she saw that I had dedicated the book to her. My whole life I’d taken for granted that I could see the Ayer Mill Clock Tower in Lawrence from the top of the hill I lived on in my hometown, which neighbored Lawrence. My eyes were also quite used to seeing the clock tower loom over Lawrence as I drove toward Rt. 495 when taking the highway north or south. But as my mind visualized one of the final scenes in the novel, the clock tower took center stage. Its significance in the geography of the city, as a symbol of the once mighty mill city, and in representing the passage of time – the Ayer Mill Clock Tower became a natural symbol within the story I was writing. I’ve incorporated into the book jacket a Photoshop sketch of a photo (above) that I took of the clock tower in July 2010. 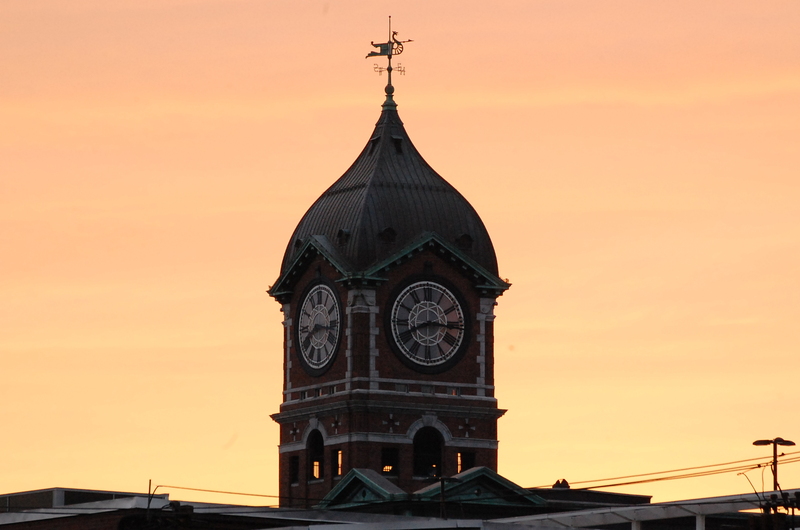 I know this is a rambling post…but what I want to get to is that today I was poking around on the Internet, reading about the Ayer Mill Clock Tower. I found a wonderful article (written in 1998) about the keeper of the clock at that time. It’s a delightful and informative read. If you’ve seen the movie Hugo, it will have even greater impact.